Originally published by Ende Gelaende. Edited machine translation by Enough 14. Berlin/Cottbus, 06.02.2019. After the excavator occupations of the Ende Gelaende coalition on Monday in Lusatia, 18 of the activists are in pre-trial detention. They are accused of trespassing. The activists protested with their actions against the final result of the coal commission and demanded an immediate coal exit. “The Commission’s result is at the expense of those who were not at the table: People in the global South and young generations who are afraid for their future. In view of this political failure, we are forced to break the rules and take the coal exit into our own hands with civil disobedience. The activists are now being treated like felons, even though they are the ones who take responsibility. We demand the release of the 18 prisoners,” says Nike Mahlhaus, press spokeswoman for Ende Gelände. In similar cases Ende Gelände activists have so far been acquitted of the accusation of trespassing because the opencast mines in Lusatia are not enclosed. Never before has pre-trial detention been ordered against climate activists solely on the basis of this accusation. The detention on remand is limited until the end of April. Negotiations are planned for the next two weeks. Ende Gelände protests today from 10 a.m. in front of the Brandenburg state representation in Berlin-Mitte (centre). From 6 p.m. a demonstration is registered in front of the state representation. 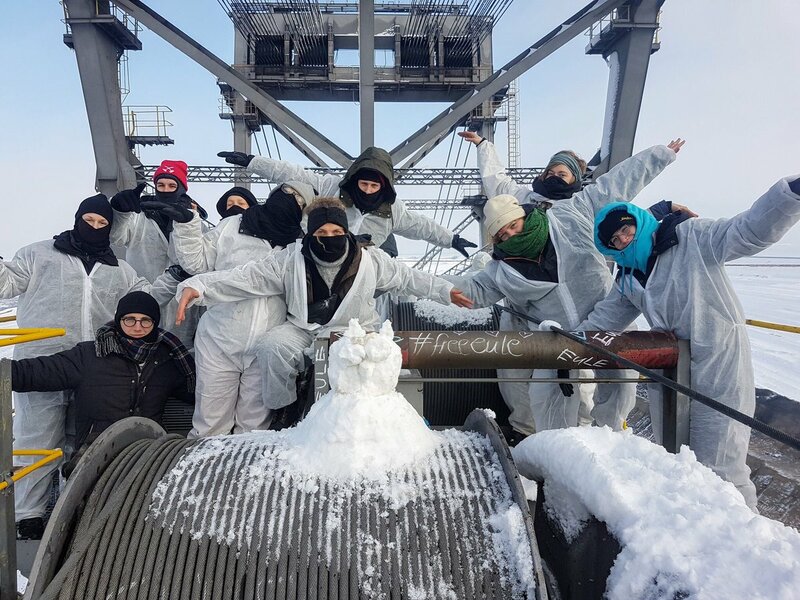 04.02.2019: Activists from Ende Gelände successfully blocked coal-fired power plants and infrastructure in Karlsruhe, Leipzig and Lusatia during a week of action against the failure of the coal commission. They insist that a coal exit in 2038 is too late, they are taking it into their own hands. Currently (Wednesday, 6 February), 18 activists are still in custody and will be brought before the magistrate.